When I met Morgan Berman a few years ago I didn’t know who she was and what she had contributed to Philly’s tech community. I knew the first iteration of MilkCrate from my own exploration in sustainable living, but the person behind the product was a mystery. When we finally met at an event she politely pointed out that there was a tag on my shirt and in that moment, between ripping off a price tag and uncouthly introducing myself, I knew everything I needed to about her. For me this demonstrated a kind and considerate person, and while that’s true about her personally, the extent of those traits aren’t limited to brief encounters at events. Morgan was, and is, kind and considerate and the app she has dedicated her career to reflects those qualities in its ability to challenge people to do good to the planet and each other. MilkCrate, a tool that combines behavioral economics with real world sustainable lifestyle information, has been a portfolio company Ben Franklin enjoys talking about (as we do with all of our incredible portfolio companies) because they embodied what we understand to be the future: impact focused and sustainability driven. 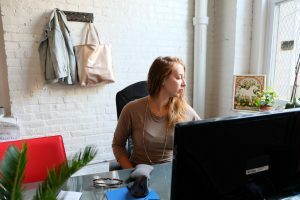 I sat down with Morgan in MilkCrate’s new offices to discuss lessons learned, how to leverage the momentum of the press, and mentorship. 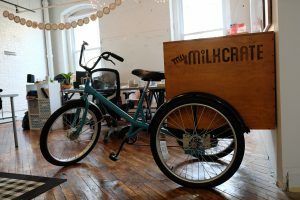 Amanda V. Wagner: It’s been four years since MilkCrate launched. What has that evolution looked like for you and the company? Morgan Berman: I had been living in West Philly learning how to be more sustainable; ride a bike in the city, composting with worms. I wanted to connect my values with my lifestyle and wanted to make it easier for others to do the same. Out of this idea came MilkCrate, which I created for my graduate program’s masters thesis. I spent the next six months designing, interviewing people, coming up with mockups, talking to potential partners, and building relationships. By August of 2014 I had assembled what turned out to be a startup team that launched the first version of MilkCrate. We launched with a lot of excitement, but not much of a business model. We got a lot of awards but weren’t making any money and I quickly realized if we were going to take this seriously, and have investors take us seriously, we needed to come up with a more financially sustainable plan. In January 2016 we radically pivoted the company and re-launched it with a b2b model that takes that same idea of helping people do good, but allows large corporations, nonprofits, and other big groups the ability to customize the goals and challenges in the app. AVW: Radical the pivot was, but now you’re working with Comcast, Jefferson University, and your reach has expanded significantly. It seems like what’s been paralleling the evolution of MilkCrate is a series of milestones you’ve reached personally and professionally. You’ve been selected for the Forbes under 30 competition, visited the White House, and gained the ear of the Philly tech community, what other milestones have marked success for you? MB: Having an employee work here for three years was an incredible milestone. As someone who had a number of really bad jobs, MilkCrate has been an opportunity for me to cathartically release some of the damage I experienced being in toxic work environments. I’m happy to be able to offer what I hope is a wonderful place to work, a place that celebrates people’s values, and a place they can contribute to something meaningful with their time. AVW: I want to return to the idea of “gaining the ear of the community.” MilkCrate is a company the community likes to talk about. How have you leveraged press or conversation to generate momentum around your company and product? MB: It’s kind of like the Forbes thing, people feel more comfortable around you when they know who you are or recognize your name. Now that we have a business development manager that isn’t me, it’s helped him go into meetings because we’ve developed a rolodex of relationships I’ve built through that recognition. The recognition has helped me get chosen for programs and receive award nominations. It might seem a little superficial, but the act of people knowing your name, and understanding a bit about you, really helps connect you with those people without ever meeting them. AVW: I’m glad you mentioned programs. What is it about participating in leadership programs, Code for Philly, and more that you have found helpful? MB: I think the very first program I did was Tribe 12, which is an incubator for Jewish entrepreneurs and it was a great place to kind of stack up and compare where we were at and where we needed to be. The programs I’ve completed since have been leadership development programs like Leadership Philadelphia, the Ariane de Rothschild Foundation, and the Environmental Leadership Program. These have been more about cultivating leadership skills and that’s something I really enjoy. I’m figuring out, now that I’ve sort of accidentally turned myself into a boss and employer, how do you do that really well. I know what it is like to be on the receiving end of a bad boss and/or management system, and I don’t want to do that to my people. The other benefit of programs like these is that they are amazing networking opportunities. AVW: Being a boss and employer, what are some valuable lessons you’ve learned along the way? MB: The first thing I always say to everyone is find a mentor and/or find some sort of north star company that you can see as a corollary example of what success would look like for you. And then, do your homework, understand them, and learn from their mistakes so you don’t have to make them yourself. I’ve also learned to find people that work at the company you admire. We are fortunate enough to have one of the founders of Venmo, Michael Vaughan, join our advisory board. There is someone who knows how to build a successful product that’s both consumer facing and—now with the acquisition of Paypal—there’s a b2b component. He understands this world, technology, engagement, and he is a really great role model to have. The second thing would be to have an outlet. For me, I started training in Brazilian Jiu-jitsu about a year ago and that has been incredible for me. It’s really important for MilkCrate to not be my entire identity. AVW: People always talk about how having an outlet has helped them, but was there a moment when you realized that you couldn’t dedicate everything to MilkCrate without sacrificing your mental health and personal life? MB: Absolutely. There were a lot of moments along the way but there was one particular instance that hit me hard. I was standing at fifth and market, waiting for the mega bus to go to New York to meet with an incredibly influential investor. I had been trying to get a hold of this investor for months and in the meantime I had just moved, my boyfriend had to leave the country because of a visa issue, and I thought I might have cancer—I had this horrible doctor experience and I had to get further testing. On top of it all, I had some really upsetting family stuff going on. It was just a horrible time and MilkCrate was running out of money. I felt like I was being crushed and I knew I had to do something different. I said to myself, “I have to change the way I am approaching my life.” It wasn’t until almost a year later that I started doing Jiu-jitsu, I tried a couple of other things in the interim but Jiu-jitsu was the one that really took and has made a big difference and re-framed the way I think about fear and risk in my career and life in general. AVW: Mentorship, having an outlet, and participating in programs: these are all things that have helped you along your journey, but are there any additional resources you recommend for entrepreneurs in the city? MB: Wonderfully enough, I get contacted by people all the time asking about jobs, just hoping we have an opening that fits their skill set. If we don’t have anything at the moment, I like to send over a resource list I’ve developed for job hunting and more. The list includes Technical.ly and Philly Startup Leaders’ job boards, and the Green Jobs Network. For anyone looking to start their own thing, I always point the to Code for Philly because that’s how I started I went to code for Philly events to just get to know the community. That’s a great place to start. Meet some people and get to know the community.